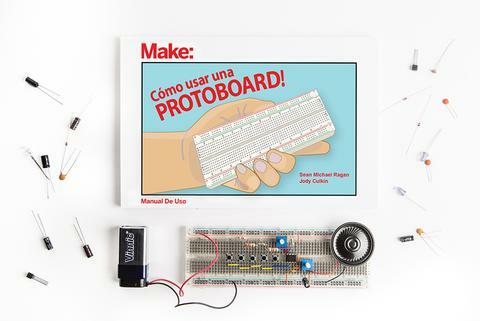 SAN FRANCISCO, May 9, 2018 /PRNewswire/ -- San Francisco-based pioneer in the maker movement, Make:, has partnered with Hacedores, a Mexico-based maker community service company, to introduce a Spanish-language version of Make:'s top-selling "How to Use a Breadboard Kit." "We reached out to Make: as we felt their skill-building kits would fill an educational need and have a tremendous impact in Mexico," says Antonio Quirarte, CEO of Hacedores. Spanish translation of one of Make:'s top-selling educational, skill-building kits. The two companies have a similar mission: finding more makers, a global community of people who use technical and creative skills to invent new objects and solutions across an infinite range of uses. The kit will be launched in the United States at the upcoming Maker Faire Bay Area, May 18-20, at the San Mateo Convention Center. Maker Faire Bay Area is an annual event produced by Make: that brings together thousands of makers to "Show & Tell" their projects with the public. The kit will be for sale in the Maker Shed tent. "Not only does the Spanish kit fill a need for the Mexican market, but we really want to start to address the demand for Spanish-language learning content in the maker community here in the U.S. Many Spanish-speaking families come to Maker Faire every year and we're excited to see their response," says Clair Whitmer, senior director of consumer experience at Make:. Both companies have launched the kit in their respective markets and hope to engage and collaborate on more maker kits in the future. Make: is a pioneer in the maker movement having published Make: Magazine since 2005 and produced events that bring together over one million people at Maker Faires in over 44 countries every year. Leading the maker movement in Mexico, Hacedores is dedicated to serving the Spanish-speaking maker community. The company is a pioneer in maker education and operates a makerspace where makers can gather and bring their ideas to life as well as hosting an online community site. Both English and Spanish versions of How to Use a Breadboard Kit are available in the U.S. at MakerShed.com. In Mexico, the Spanish-language kit is available at Tienda.Hacedores.com.